As leaders, employee trust is one of our most valuable possessions, but it's also one of the easiest to compromise. Without trust, our organizations lack open collaboration, viable long-term goals, and dedicated employees. 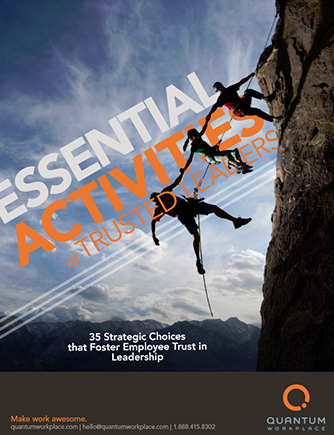 We know that building trust in leadership can seem like a daunting task — good thing we're here to help. With these daily activities, you can be well on your way to creating a culture where trust can flourish. Download this ebook to fast-track your leadership efforts!